For 25 years, fans of the Three Stooges have gathered in North Tonawanda’s historic Riviera Theater to watch a selection of pratfalls, puns, slapstick and side-splitters. That’s a lot of years for a comedy festival, but it pales in comparison to the Stooges devotion of the Marinaro family of South Buffalo and West Seneca. The family patriarch, Joseph Marinaro, born in 1929, grew up watching the comedy trio puncture pomposity and enmesh themselves in ridiculous situations in more than 200 short films on the silver screen. “He was the first one to fall in love with them, and he just thought they were the funniest thing,” said Joe’s daughter-in-law, Sarah Marinaro of South Buffalo. Joe Marinaro passed the love of the Stooges on to his 10 children before dying in December. The oldest of Joe’s children, Dan Marinaro, now 59, made a Stooge fan out of his wife, Sarah. They shared their appreciation of the manic, quick-quipping trio with their son, Dan Jr., who has a young Stooge fan of his own in son Derek, 6. 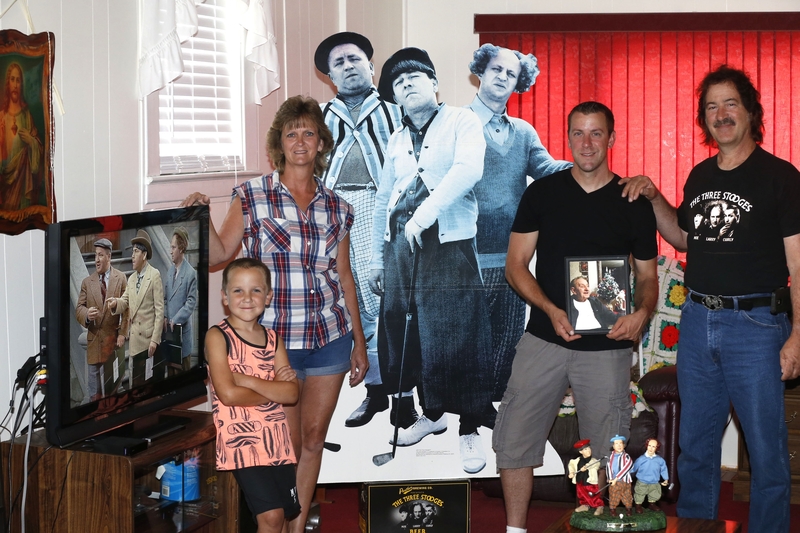 Three generations of the Marinaro family will attend the 25th anniversary of Stoogefest, a Three Stooges film festival, which starts with an organ concert at 3:30 p.m. Sunday in the Riviera Theatre. The couple’s children, who include Jennie, 30; Margaret, 24, and Sarah, 21, grew up as fans too thanks to TV reruns, Stoogefest and their parents’ collection of VHS tapes and DVDs of the Stooges. To this day, “When we can’t agree on what to watch, we watch the Stooges,” said Sarah. The Marinaros are not only faithful fans of Stoogefest – Dan Sr. has missed only a few – but are known for the depth of their loyalty to the comedy trio. For quite a while, a life-size cutout of the Stooges dressed in golf gear from the famous “Three Little Beers” episode stood in the front window of their house. But they are far from the only family in which grandparents and youngsters will sit side-by-side, said Potwora. After the organ concert, The Knuckleheads, a classic rock band in which Potwora plays drums, will take the stage. After that, the immediately recognizable, lilting “Three Blind Mice” tune will play to the roars of the crowd. The Marinaros will be introduced at the 25th anniversary event, as well as Pat Wheeler, who, along with Potwora, has attended every festival. Stooge fans are bitterly divided over the changing lineup of the trio. Moe and Larry stayed in the group from the 1920s until 1971, but other comics joined them in the early days and again after Curly had a stroke while filming “Half-wits’ Holiday” in 1946. The replacements included Moe and Curly’s older brother, Shemp, Joe Besser and “Curly Joe” DeRita. Sunday’s festival will include one episode featuring Shemp, Potwora said. Joe Marinaro, his son Dan and another son, Paul, attended a Three Stooges convention in Philadelphia in 1988, and around the same time Paul Marinaro led a campaign to get the Stooges commemorated on a U.S. postage stamp. “It’s like a big family, you see everybody that you see every year,” said Dan Jr. “They don’t show the same stuff, there’s always something different, but it’s a tradition. Doors open at 3 p.m. Aug. 21 in the Riviera Theatre, 67 Webster St., North Tonawanda. Tickets are $12 for adults and $7 for children 12 and younger at the door, World Hollywood Entertainment in the McKinley Mall (828-0139) and via rivieratheatre.org. Anne Neville – A native of Albany, Anne Neville has a master's degree in public affairs journalism from Ohio State University, where she was a Kiplinger Fellow. Since May, she has been assigned to write obituaries.